Exporter of a wide range of products which include patch palm riggers glove. We offer Patch Palm Riggers Glove. 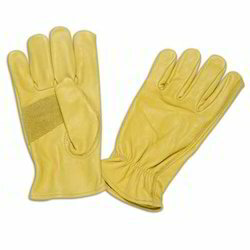 These beautiful Yellow coloured Grain Driving Gloves are resistant to acid-chemicals. These Grain Driving Gloves are provided in wide colour range and are easy to wear. It's a high quality product specially designed for your comfort and need which gives you proper safety.